Cyber-Physical Systems establish a close connection between the digital (cyber) and the physical world. Today, a growing network of embedded and autonomous systems, influences our daily routine — from smartphones to automobiles to medical engineering and cloud computing. This presents a wide range of challenges to researchers and developers. With the systems’ increasing complexity, requirements for safety, security, correctness and reliability grow as well. At the Cyber-Physical Systems department of the German Research Center for Artificial Intelligence, a young and international team of computer scientists and mathematicians works on incorporating reliability and correctness into the system design process from the very beginning. To this end, new methods, test procedures and applications are investigated and developed. This work proceeds in projects together with our industrial partners and in fundamental research. The aim is to bring high-class research into practical applications as fast as possible. The department also collaborates closely with the Group of Computer Architecture of the University of Bremen. Part of the Cyber-Physical Systems department is the Bremen Ambient Assisted Living Lab (BAALL), where innovative technologies are tested, evaluated and demonstrated. The BAALL is a realistic apartment of 60 sqm accessible for the aged and disabled, in which mobile assistant systems for people with movement restrictions are developed. Another area of application is the robot football team B-Human. 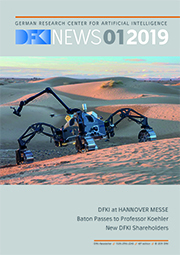 Here, researchers of DFKI work in collaboration with students of the University of Bremen on the development of safe and robust software for robots acting autonomously and as a team. These algorithms are used in other research areas as well.